On Oct. 7, 1984, Chicago was engulfed by gloomy skies and dreary, nippy weather. But that was just the kind of weather the Chicago Bears liked to play in, and specifically when they enjoyed playing their ground and pound brand of football. Could there be more perfect weather for the day that Bears running back Walter Payton would overtake all-time rushing leader Jim Brown’s record at Soldier Field? It was the seventh game of the season, and Payton faced the New Orleans Saints. After opening the season with a three-game winning streak, the Bears found themselves in the midst of a two-game slide. Chicago’s Sunday afternoon contest against New Orleans seemed to be following the same script, as the Saints jumped out to a 13-7 lead. ”For the past three weeks, I have tried to conceal it, but there has been a lot of pressure,” Payton admitted. ”It’s been really hard to deal with. I’m glad I don’t have to do this every week. There was a lot of pressure, and if you don’t know how to deal with it, you can go astray. Unlike the previous game when Payton ran loose for 130 yards in the first half of the game, New Orleans managed to bottle him up for 34 yards on six carries through the first 15 minutes of play. The second quarter was more of the same, accumulating 30 yards on nine rushes, including a 1-yard touchdown run with seconds to spare in the half. 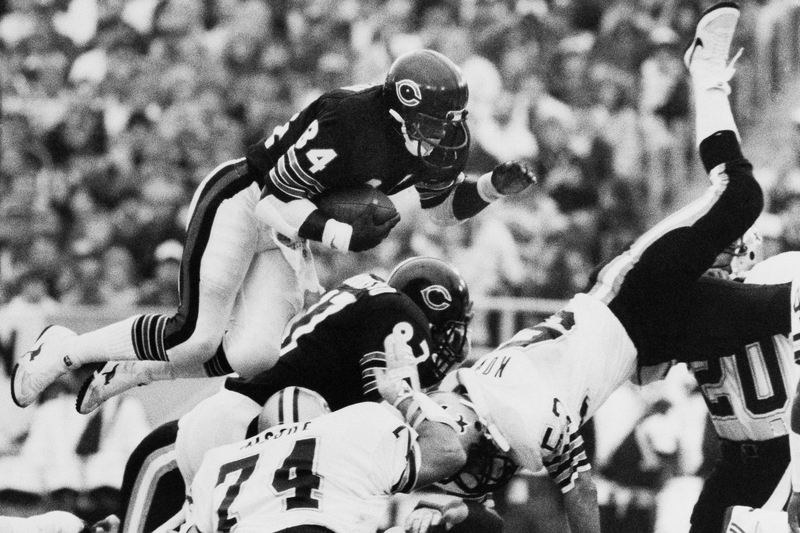 Chicago Bears’ Walter Payton (No. 34) is up and over for short yardage during second quarter action against the New Orleans Saints on Oct. 7, 1984, in Chicago. So going into the second phase, Payton only needed three yards to claim the record. The Bears returned to the field with 53,752 fans chanting, “Walter! Walter!” only for quarterback Jim McMahon to throw on the first play after halftime. No one was expecting that. Toss 28 Weak. A pitchout for Payton, one that he had run too many times to count, surely, was the play he would pick up the necessary yards. Fullback Matt Suhey, who ran behind left guard Mark Bortz, blocked in front of Payton. God bless the defenders standing in the way of those two men as they sprung Payton loose for a six-yard gain and the record. The Hall of Famer picked himself off the grass, shook the hands of Suhey, Bortz and the rest of teammates and waved to the fans. By game’s end, Payton had amassed 32 carries and 154 yards, bringing him to a grand total of 12,400 career yards. He finished 88 more than Brown, and also collected Brown’s record of 100-yard rushing games with the 59th of his career.